To Juice or To Soup? That is the Question! I’ve been contemplating embarking upon a juice fast. I understand that there are many health benefits associated with juicing. But honestly, I am more of a soup girl. Homemade soup. Made-from-scratch soup. I find the textures, shapes, and colors of soup ingredients appealing. This time of year, a bowl or mug of warm soup just makes me happy. And then there’s that awesome aroma of a pot of soup simmering on the stove. Mmmmm. Need I say more? I’m scrapping the juicing, and going for souping! As part of my continuing efforts to further reduce the amount of processed and containerized foods in my diet, not to mention the sodium contained in both, I decided to try my hand at homemade stock. Again. I’ve made a few batches over the years, but never stuck with it, mostly because of time constraints and the fact that good stock needs to simmer for several hours on the stove top. Back around Thanksgiving, with a turkey carcass looking pitiful in the roasting pan, I wondered if I could use my large slow-cooker to make some stock. I googled “stock in slow cooker”, or something like that, and guess what? Many, many other people have had the slow cooker idea long before it floated into my mind! Go figure. I read through a bunch of recipes on-line and perused the stock information in my Joy of Cooking cookbook. And then I decided that even if I hadn’t invented the idea of making stock in a slow cooker, that didn’t mean I couldn’t invent my own recipe! Sometimes I just get in the mood to not play by the rules, and I guess I was in one of those moods, because I decided to name my recipe “Use What Ya Got Stock”. I did (use what I had on hand), and the turkey stock was delicious. I’ve made two batches of chicken stock since (using what I had on hand), and both times it was equally delicious. Using my own stock has taken my soup game to the next level. I highly recommend it. Here’s a basic list of ingredients I’ve used, and the process that worked well for me. Try it – I think you might like it! 1 cooked turkey or chicken carcass – bones, skin, & cartilage with most of the meat removed (deli-rotisserie chicken carcass works nicely). Cooked down drippings and bits from the roasting pan can be used as well, unless they are super greasy. Raw aromatic vegetables, cut in to large chunks. Remove peel or skin. I usually have carrots, celery, onion, and garlic on hand, and I use all of them. I use 1 onion, 2 or 3 cloves of garlic, 3 carrots, and 3 ribs of celery. Adjust amounts according to the size of your slow cooker crock. Fresh rosemary – 3 to 5 sprigs. Bay leaves – 5 to 7 leaves. Whole black peppercorns – about 10. Dried tarragon – about a teaspoon. Chili powder – about a teaspoon. Cayenne pepper – about a half teaspoon. Kosher or Sea Salt – about a teaspoon. I had small amounts of some herb mixes that were past their prime in my spice cabinet, so I tossed what was left of them in to the crock as well. Place the poultry bones, skin, etc. in the slow cooker crock. Distribute the vegetables, herbs, and spices in and around the poultry parts. Add filtered water to cover all ingredients and fill the slow cooker crock to about an inch from the top. Place the lid on the cooker, and cook on high for 1 to 2 hours, then reduce temp to low and cook overnight – about 8 to 10 hours in total. When done cooking, remove bones and what is left of the vegetables & undissolved herbs with a large slotted spoon and allow to drain in a colander placed over a large bowl or soup pot. After the liquid is finished draining from the colander, remove and discard the solid contents of the colander. Add the remaining liquid stock from the slow cooker to the liquid in the bowl or soup pot, and allow to cool for about 30 minutes. Place the cooled stock in the refrigerator – in glass container(s) – do not use metal containers, cover, and leave overnight. The next day, the fat will have risen to the top and solidified, and can be skimmed off with a spoon and discarded. The stock itself may be gelatinous (jelly like), and this is due to the collagen that has been extracted from the cooked bones. Collagen is not fat, and is a big part of what makes homemade stock so healthy and delicious. Pour or spoon the stock in to storage containers for refrigerating or freezing. I store stock in 16 oz mason jars with plastic screw top lids in the refrigerator for 1 to 2 weeks. I’ll typically use 32 oz (4 cups) of stock in most of my soups, so I’ve been keeping two mason jars to refrigerate for use in the short term. Any left-over amount of stock is placed in freezer safe containers for use at a later date. Categories: Food, Journal, Little Bits | Permalink. The empty chicken coop, with its door propped open and its aged red metal exterior, whispered to me. The sight of unbroken deep snow at the back edge of the yard, along the stream buffer, brought a little flutter of sadness, a soft tug in my heart. No deer tracks, as there had been in prior years. No feral kitty tracks. No rabbit tracks. No flock of frustrated Rhode Island Reds clustered in the doorway of the coop, yacking and complaining about the white stuff on the ground. As I stood just outside the back door of the house, admiring the beauty of the snow, missing my beautiful chickens, my thoughts turned to the hawk family. I had not heard their piercing calls recently, nor noticed them circling in the sky. I had not recently noticed the hawks perched in their usual vantage points, hunting along the stream. The unusual and frequent summer & fall flooding of that stream had very likely drowned or swept away many of the frogs, toads, snakes, etc. who lived in the nooks and crannies along the steep bank. I wondered if the hawks had moved elsewhere to find food, or, if they too had been swept away or injured in the tropical force winds or torrential downpours. I stood there in the snow, wondering about them. Thinking back to our first winter here, noticing them daily, watching through binoculars as they took turns flying food up to their nestlings in the tall pine across the road. In that moment, I realized how much delight their continued presence had brought to our lives. And, how, as with many neighborly relationships, there were “complications”. For, on more than one occasion (and far more than I was aware of, I’m sure), the hawks set their sights on my chickens. There was no delight in those moments. Those were moments in which the normally docile grey haired woman morphed into a screaming banshee – running to the rescue, waiving her arms or whatever towel, rake, or walking stick that might be handy, clapping, hooting and hollering all the way. Those were moments in which the Mother Hen in me switched in to high gear. Those were moments in which both the hawk and my neighbors undoubtedly thought I had lost my mind. Thankfully, although the hawks traumatized the flock on a fairly regular basis, and tore up a couple of the girls pretty badly, none of the chickens perished due to hawk inflicted injuries. The girls (and I) learned to tune in to the warning calls and behaviors of the wild birds, the neighborhood gang of crows, and the squirrels. We learned that the hawks usually hunted along the creek and from the trees near the chicken yard twice a day – at about 9:30 or 10:00 a.m. and again about an hour or two before dusk. The girls developed a morning routine of fanning out and foraging near cover and in close proximity to the coop. Late in the day, toward dusk, the hawks seemed disinterested in the chickens, and by that time of the day the girls were usually hanging out under the huge Japanese Holly bush that we called The Chicken Bush, or they were already in the coop, getting settled and ready to roost for the night. It worked out. We all co-existed. As I stood in the snow, late in the day on Thursday, the chicken coop whispering to me, my head and my heart full of memories of Rhode Island Reds and Red Shouldered Hawks, I felt that unbroken snow along the stream buffer beckoning me, enticing me to break through the ice encrusted top layer, leave some footprints of my own. I made my way to the earthen bridge, each step crunching as my boot broke through the icy crust. The water in the creek was gurgling happily as it swirled around and over the rocks and exposed tree roots along the bank. There was twittering and the sound of wings flapping as songbirds rose out of the cover along the stream bank and into the tree branches above. I stopped at The Chicken Bush, near the gate, its branches laid low and sprawling under the weight of the wet snow. A large rabbit broke from her cover, popped through the fence, and headed for overgrowth behind the neighbor’s tractor shed. I walked to the grapevine arbor and looked all around for signs of wild neighbors – paw prints, hoof prints – there were none. I turned toward the chicken coop, stopping to free a couple of Redbud saplings from their heavy snow burden. As I approached the door of the coop I expected a couple of little wrens or nuthatches to drop down from the roost above the door and zoom past my head. Nope. Nobody. The coop stood silent and dim inside, only the sound of a slow drip from snow melting above the entry. Standing there, looking in, I wondered why the coop had whispered to me. Was there something I was missing? I stood there for a moment, listening to the drip drip in the dim entry, and then turned and crunch, crunched my way back past The Chicken Bush and to the earthen bridge. And then, there she was! Swooping and banking along the creek and through the tree branches. I could hear the sound of the air in her wings as she pulled up and landed on the lowest branch of a young oak, not more than 15 feet from where I was crunching along. I froze, drew in my breath sharply. I had seen her dark eye as she steered toward her landing spot. But now her head and her view of me was blocked by the trunk of the young tree. I could see her fluttering her striped tail feathers – shaking them from side to side as she sat there, focusing on the creek bank, waiting for some small prey to move. I remained absolutely still, a knot forming in my throat. Never having been so close, I literally felt her presence. For some reason, I wanted to let my presence be known as well. So I slowly leaned to my right and peaked around the tree trunk. She caught sight of me, I saw the flash of recognition in her beautiful dark eye, and with a surprised little muffled squawk/gurgle, she rose from the branch, spread her wings, and disappeared among the trees lining the creek bank. My hand on the door latch, I turned toward the creek, wished her successful hunting, and thanked that little red chicken shed for whispering me back to the chicken yard, late in that snowy grey day, about an hour before dusk. Categories: Life, Place | Permalink. I’ll pour ye a cup o’ cider! Wassail – Waes Hael – Be Well, Good Health! And Blessings to the Trees! Wassail! Lift ye cup o’ cider! Wassail , from Old English waes hael, is a beverage made of fruit juices, most commonly apple juice or cider, and spices, slowly heated and served warm. The Old English waes hael means “be healthy”. The ancient tradition of “wassailing” included singing, toasting, and drinking the beverage – to the health of the villagers and to the health of the apple trees, blessing the trees in the hopes of bountiful harvests to come. I like the idea of acknowledging and showing appreciation for the bounty that Gaia provides! For without that bounty, where would we be? Place cloves in a mesh tea basket. Add apple and cranberry juice to a large saucepan. Dissolve brown sugar in the juices. Simmer until hot over low heat with cinnamon sticks and clove basket. If you need to keep the wassail warm for an extended perior of time, transfer to pre-warmed slow cooker, low setting. Serve in glass mugs and garnish with a fresh cinnamon stick & orange wheel. Wassail can be stored in refrigerator for up to one week. Remove and discard cinnamon sticks and cloves prior to storing in refrigerator. P.S. The house will smell like heaven! This is a great beverage to serve for a holiday open house – your guests will be greeted with the delicious yuletide aroma upon arrival! Categories: Food, Journal, Little Bits, Quotes | Permalink. Don’t forget you-know-who when you’re doing your holiday baking! Woof! Combine dry ingredients in a large bowl. Add peanut butter, honey, and eggs. Beat on low until well combined. Gradually add water, beating until dough holds together. Place dough on large sheet of parchment paper & cover with a second large sheet of parchment paper. Using a rolling pin, roll out until dough is about ½ thick. Slide parchment with dough on to a large cookie sheet and chill in refrigerator for 1 hour. Remove dough from refrigerator, remove top parchment. Preheat oven to 300 degrees Fahrenheit. Using a bone shaped cookie cutter (or any fun shape(s) of your choice), cut out cookies and place on a parchment-lined baking sheet. You can also use a cap from a soda or water bottle to make small rounds. Gather up extra dough pieces and roll out again or roll into small balls and flatten with your thumb. Use up all that luscious dough! Bake 1 hour. Cool on rack. Recipe makes about 20 bone-shaped cookies, 3” long. Combine oatmeal, oil, and water (or hot broth) in a large mixing bowl. Let stand 5 minutes. Stir in powdered buttermilk, grated cheese, salt & egg. Add cornmeal and wheat germ. Mix well. Add flour, about a half a cup at a time, incorporating well each time. After all the flour is incorporated, knead 3 to 4 minutes to make a very stiff dough. Preheat oven to 300 degrees Fahrenheit. Roll out dough to about ½ inch thickness. Using a bone shaped cookie cutter (or any other shape(s) of your choice), cut out snacks, placing on lightly greased cookie sheet. You can also use a cap from a soda or water bottle to make small rounds. Gather up extra dough pieces and roll out again or roll into small balls and flatten with your thumb. Use up all that luscious dough! Bake for 1 hour at 300 degrees. Turn off heat and leave the snacks in the oven for 1 hour or longer. Recipe makes about 2 pounds of snacks. Even though I’ve often thought it would be cool to make my own soap, I’ll probably never get around to it, so I’m content to buy from people who know what they’re doing. I buy most of mine from the local berry farm – I know, who would think, right? There are also a couple of goat’s milk soap makers at nearby farmer’s markets, and their soap is lovely as well. I’ve never ordered on-line. I need to smell before I buy! 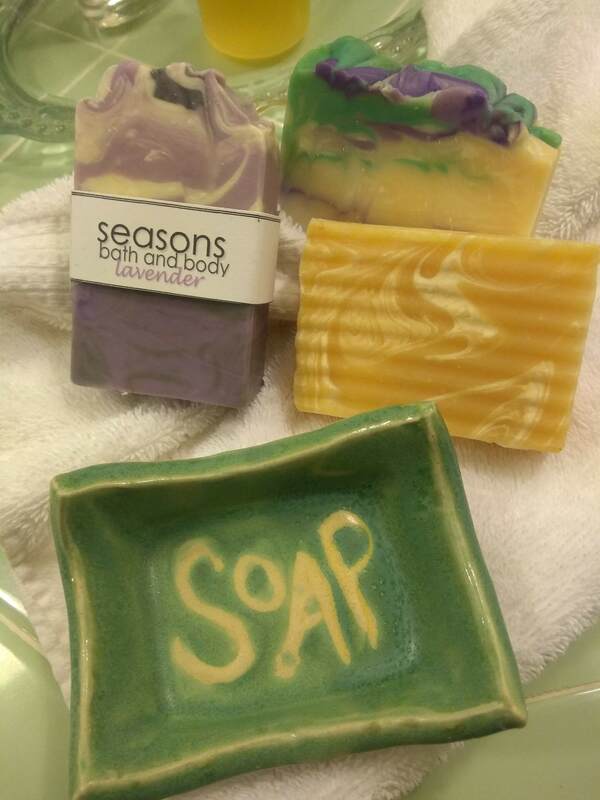 A friend who was visiting a few years ago purchased the cute soap dish in the photo from a local artisan shop. She left it on my bathroom counter, along with a nice bar of soap, for me to find after she had gone. What a nice surprise! There are video tutorials on-line, and loads of ideas on the web for making your own soap dishes from air-dry or oven-dry craft clay. Crafty kids might like to make a simple soap dish for their teachers, or for auntie, or for family / friends who may be house guests during the holiday season. Happy Holidays, and, perhaps, Happy Lathering! Categories: Life, Little Bits, Quotes | Permalink. Each day comes bearing its own gifts. Untie the ribbons! Is there Someone in Your Life who could use a good excuse to slow down & snuggle up with a good book on a Winter’s afternoon? Could that Someone even be You? Do you have a favorite book by a local author? Perhaps you have a treasured book on your shelf that you would like to share with a loved one? If you are interested in finding / reading “local”, independent bookstores usually have a section devoted to writers from the area. Art & craft galleries often sell self-published books by regional writers. And gift shops / visitor’s centers at state & national parks in the U.S. sell books written by regional folks as well. Many of these locations have special holiday events with author signings, food, wine, or music. Shopping with small businesses and shopping local not only supports your local economy, but the experience of it is also a gift to yourself! Categories: Little Bits, Place, Quotes | Permalink. 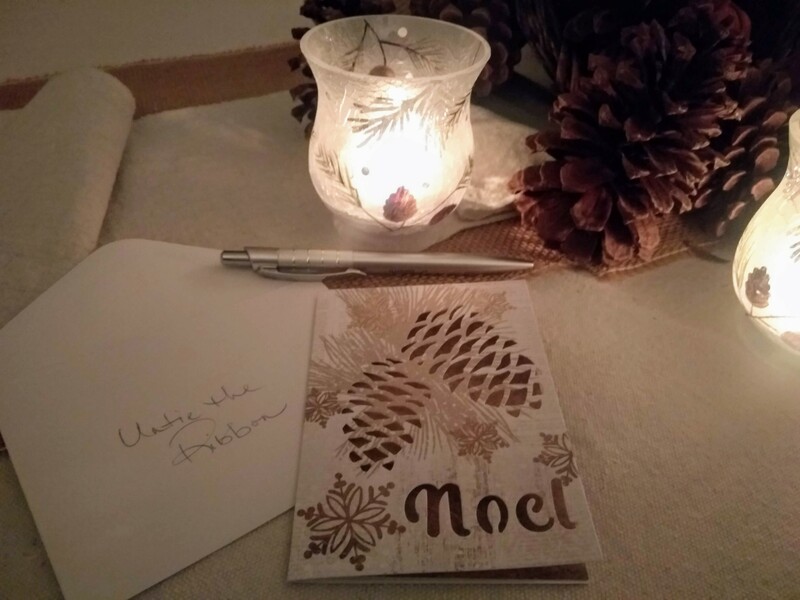 I’ll be posting a little Gift of Inspiration for each day of Advent 2018. I hope you will find some inspiration here. Whatever it may be – please accept my wishes for Happy Holidays and Abundant Simple Goodness! How bountiful laden with fruit are thee! Colors of Earth – Purple!